I can’t stop looking at pictures of cute, adoptable dogs. I. Can’t. Take Cookie, for example. Cookie, who would be given the name Brian just as soon as she came home with me (it’s fine; it can be a girl name). She likes to snuggle and chase a toy? She’s perfect. But I can’t adopt her yet and I so wish I could. Happy pets live with owners who spend time with them, and I’d want my dog to be the happiest. The ASPCA estimates that approximately 3.9 million dogs enter shelters each year in the United States. Each. Year. Only about 649,000 of those dogs are ‘lost’ and returned to their owners. That leaves over 3 million dogs just waiting to come home with me (or you). And the vast majority of them aren’t scary or mean or broken—they’re perfectly friendly and lovable. Like Cookie. Little charmer, that one. So if you’re thinking about getting a dog, and you’ve got the time to play with, walk, run, rub, train and feed your future dog, please consider adoption and let me live through you vicariously. Also, please invite me over to your house to play with your dog. I’ll even be on poop patrol (like once). That’s Bam Bam, an adoptable dog in Minnesota. OMG. Take that pup home! 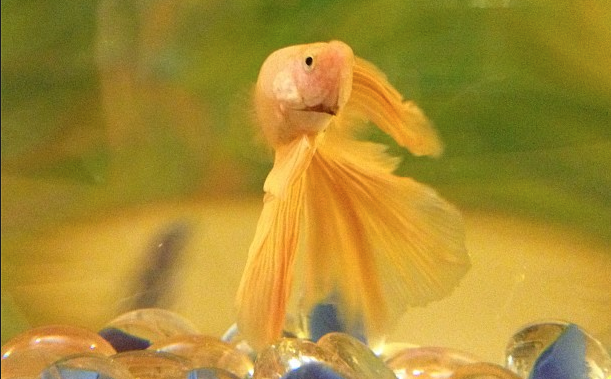 Brian Boitano passed away yesterday (the fish, not the human). I have yet to confirm his passing with my own eyes, but after responding affirmatively to my are-you-sure-he-isn’t-just-playing-dead questions, his trusted fish sitter has convinced me he is gone. I feel sad about this. It’s easy for humans to feel attached to warm, furry things that remind us of cute little babies – but we do develop love and affection for the slimier species as well. Brian was a good fish and I miss him. In his honor, here’s a list of four things I learned from the sometimes aggressive, sometimes lethargic, but always-graceful Brian Boitano. Everybody feels better around plants. I couldn’t put real plants in Brian’s water (mold and the like – you know how it is), but when I moved his bowl to sit right next to my ivy plant, he recognized the green leaves and snuggled right up to them. Nature soothes, and is an important and often absent element to city life (or giant pickle-jar life, in Brian’s case). Never underestimate the power of clean water. It probably sounds trite for me to say that watching my fish enjoy his monthly clean-water exchange gave me a higher sense of purpose when it comes to global water issues, but it’s true. Clean water is a precious resource and an absolute necessity that one in nine people do not currently have access to. For information on seven organizations committed to clean water access, water education and/or sustainable water use, check out this list from goodnet.org. Lying around all the time is never a good thing. If you find yourself too tired to exercise, explore your world or eat, you’re in trouble. Mix it up and adjust your life before it’s too late. Pink can be pretty and strong at the same time. Brian’s wavy fins would make beautiful sweeps and flourishes around the bowl (before he started lying around all the time), but he could probably bite your finger off if he really tried. He moved his marbles around, no problem. So the next time your little kid wants to wear a pink dress and climb a tree, just think of Brian. It’s totally cool. I still sleep with a stuffed animal. He’s an adorable, well-kept and not-too-soft but not-too-firm white bear, about 12 inches long from head to toe. 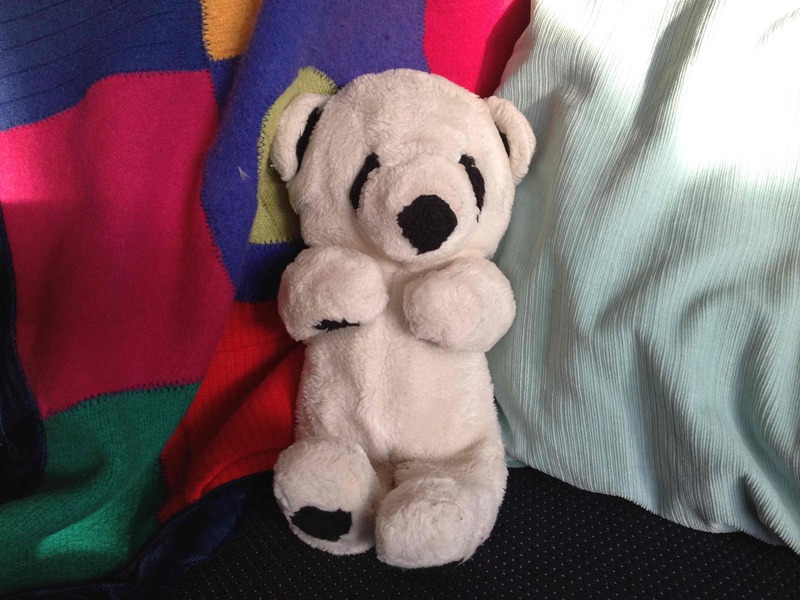 He has a disproportionately large head, black circles for a nose, ears and paws, and black caterpillar-shaped eyes that seem both kind and sort of absent. His legs bend forward at the hips and his arms open gently with a little pressure. The tops of his feet and nose have worn away slightly, revealing the beige knitted pattern beneath his fur. He’s 27 and a half years old. I know, because I got him as a “we-still-love-you-but-you’re-no-longer-our-only-child” gift when my middle sister was born. She got Bun Bun around the same time—a floppy pink rabbit that barely survived toddlerhood. My bear doesn’t have a name; just a gender. I think he made it through the tough years because I never played with him or dragged him down store aisles or up trees—I just tucked him into the triangle of my chest and upper arms each night and slept soundly. A few days ago, my mom shared an article with my sisters and me titled A Firm Grasp on Comfort. In it, Dr. Barbara Howard, a developmental-behavioral pediatrician at Johns Hopkins, posits that as many as 25 percent of young women going off to college take their childhood comfort objects with them. At 18, I was one of those 25 percent. At 30, I’m guessing the percentage of us has dwindled significantly, especially since many of my peers are giving comfort objects to children of their own now. Although I don’t travel with the bear (he just looks so sad when I try to squish and cram him into luggage), I’ve grown seriously accustomed to him. In Australia, I bunched a travel pillow into his general shape and snuggled it into my shoulder every night. On the occasions when I don’t have a travel pillow, I usually roll up a sweatshirt instead. It’s unclear to me whether this is out of habit, ergonomics or nostalgia, but the fact is that I just sleep better with my arms around something. So, I’m curious. How many of us are still out there, hugging stuffed animals and sneaking peeks at ragged silk blankets? (Blanket people—even though I am not one of you, I think we’re part of the same category here.) I’d love to read your comments if you have them. This is a sharing weekend. But there’s so much to share, I had a hard time figuring out where to land today. Then it hit me—the ground. Courtesy of the awesome Planet Earth Phenomenon Facebook page, here’s a picture of an adolescent elephant throwing a tantrum. On the ground. In what looks like a really nice and gushy pile of mud. Elephants experience an array of emotions, from joy and sympathy to jealousy and rage (visit PBS.org for more on the wide variety of elephant emotions). In the balance-seeking, happiness-obsessed culture of the average, yoga-taking American, seeing an elephant tantrum is a great reminder that balance requires weight on both ends. We experience peace and distress in order to know where the middle ground lies. Light needs dark. It’s natural. Our car broke down on Tuesday. It was a trusty machine that carted us all over the coast of north Queensland, but it just couldn’t make the last few hundred kilometers back to Cairns. We woke up early Tuesday morning in Mission Beach with plans for a packed day of travel throughout the Atherton Tablelands. After a hearty breakfast of a delicious local mango, leftover pasta primavera and potato chips, we piled ourselves back into Ciara’s ’95 Toyota Camry only to find it “sort of unwell,” as the local mechanic put it. It wasn’t going anywhere. So after seven hours, a tow truck ride, an exciting Cassowary sighting, a thorough tour of the small town of Tully, pounding rain, a couple of good sandwiches and the sad realization that the Camry’s computer was fried, we were back in Mission Beach, car-less for the foreseeable future. Happily, neither of us panicked, even with my 5 a.m. flight out of Cairns still a few driving hours away. We’d also received some extreme doomsday warnings about the water levels on the roads heading out of Mission Beach (“Oh you’ll float away, no question. Don’t even bother.”). 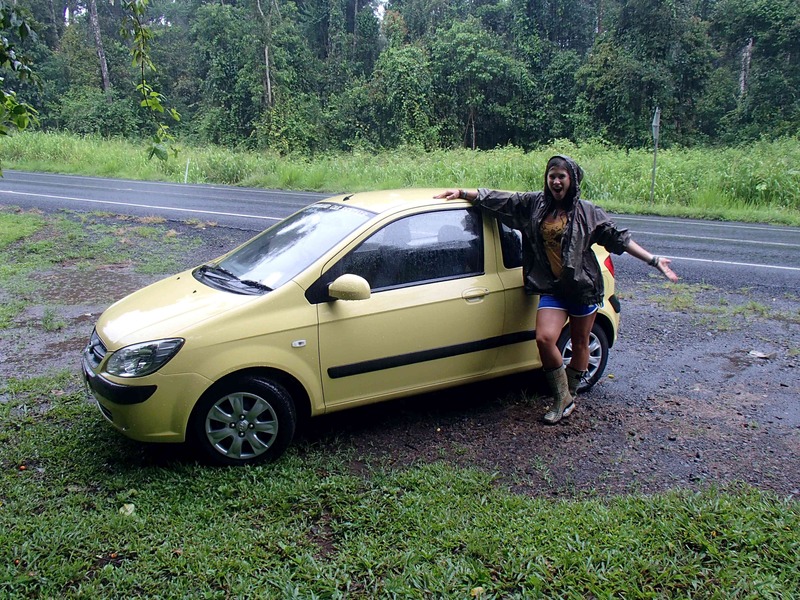 The combination of Ciara’s extremely thorough questions and rockin’ Aussie roadside assistance afforded us a cute yellow rental car, a free stay in a fancy hotel and a firm understanding that some of the locals tend to exaggerate the poor driving conditions. I’m proud to say that even after our unexpected delay, we crammed at least one day’s worth of Tableland-ing into the last three hours of my final day in Australia. I even managed to get a land leech stuck to my leg during a hike through the rainforest. Badass. 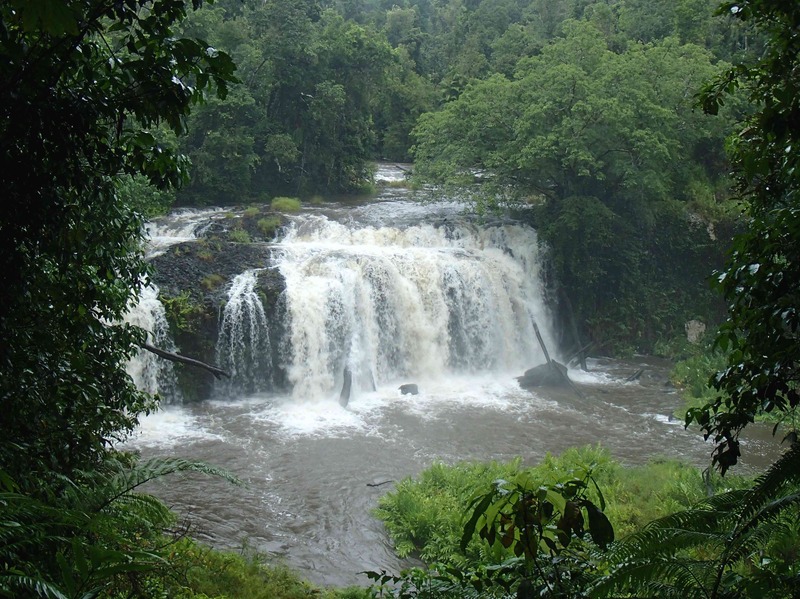 Wallicher Falls, one of many gorgeous rushing waterfalls in the Tablelands. 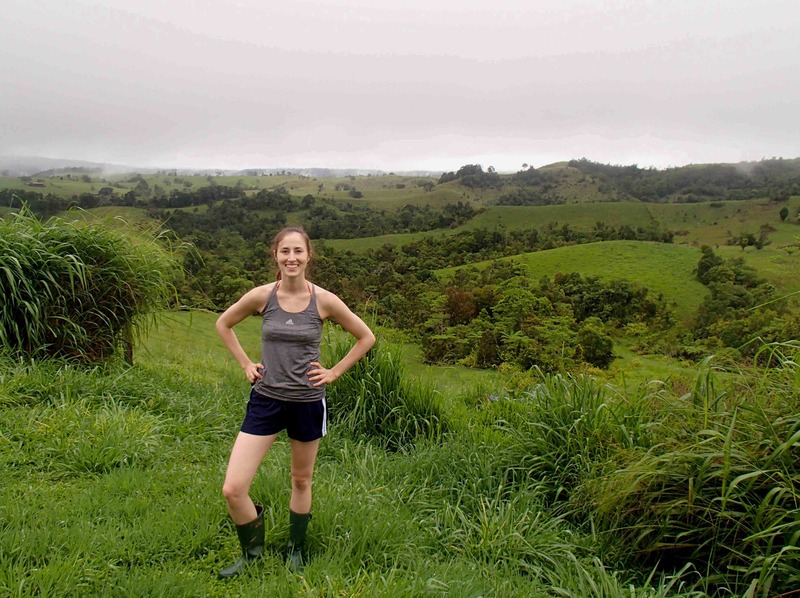 Lush dairy farmland, which appears only moments after exiting the rainforest. 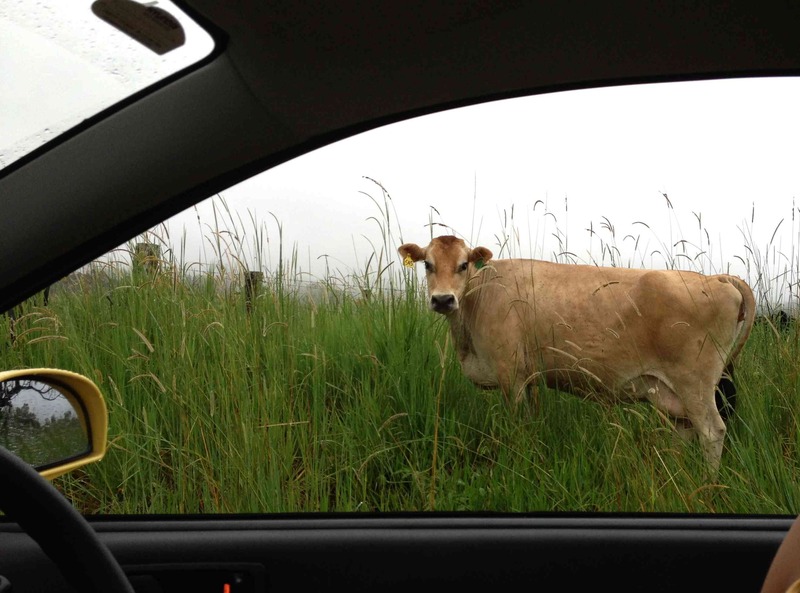 Easy-going cows, who calmly meander around and in front of driving vehicles.